Traditionally live on Channel 24 at 22.00 on 6 September. On Tuesday, 6 September, the new season of the show Left Bank with Sonya Koshkina starts on Channel 24. The first guest of the first programme in the new season after the summer holidays will be Interior Minister Arsen Avakov. Avakov is the only minister who has served continuously since February 2014 in the two governments of Arseniy Yatsenyuk, and Volodymyr Groysman's current cabinet. As a guest of the studio a year ago, he talked about the problems in the parliamentary coalition and backroom processes, the reform in his department and the challenges that the ministry was facing after the launch of a new police force. 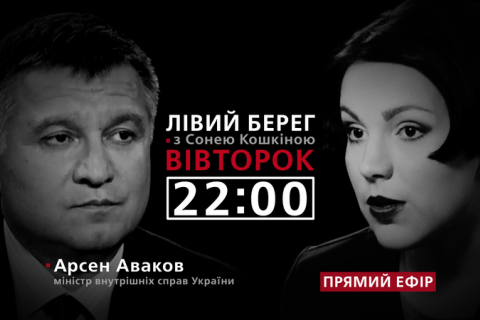 What has changed over the past year, how the police reform is moving on, how high-profile cases are being investigated, what role the political aspects play here – all these and many other things in Arsen Avakov's interview with Sonya Koshkina on Tuesday, 6 September at 22:00, live on Channel 24. The text version of the interview will be published on LB.ua later.